Just as you get yet another wedding invitation, we understand you instantly going into frenzy mode looking for perfect jewellery to go with your attire. But Arsya Jewellery has got you covered – a one stop solution to authentic-looking statement pieces, and customised jewellery. 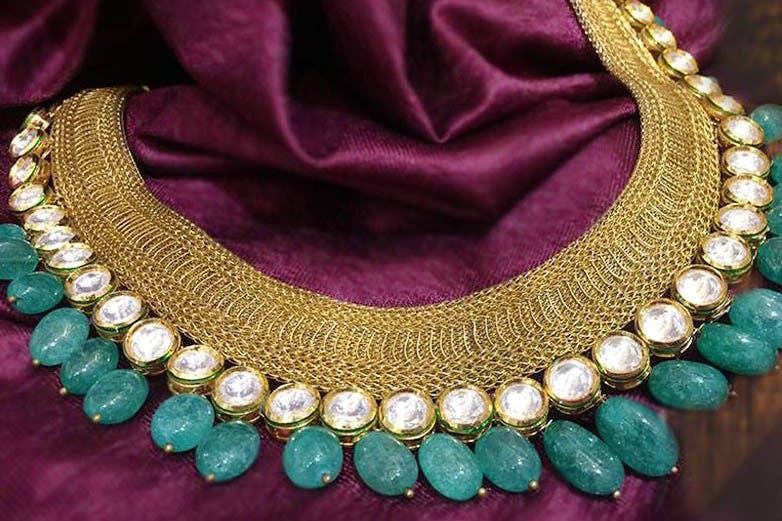 Temple jewellery, Kundan, Meenakari, or stone-studded statement pieces – there’s one for everyone here at Arsya Jewellery. A boutique store located in an otherwise crowded street in Bandra west, it has a varied range of earrings, neck pieces, chokers, bracelets, embellished watches, rings, nose rings, and bangles…phew! This basically means that you only need to know what colour you’re looking for and everything else will be taken care of in one go (let’s not even get into how many extra things you’d be buying). But that’s not even the best part of Arsya Jewellery. What stands out is that they understand your needs and are happy to customise pieces. And all they need is two hours. Most of their jewellery is handcrafted using 92.5 silver topped with antique gold polish, and neatly designed using the Persian art of coloured stones, Meenakari. If you are not operating on a tight budget and have a couple of grand to spare, let’s just say your hunt for a jewellery haven has ended. Who wouldn't like getting customised jewellery in two hours? So next time you've got a wedding to attend and have nothing to wear, head here for your dose of (customise) bling.